Since I’ve been blogging for Ghostbikes.com I’ve yet to make a post that’s for a product specifically made for the lady bikers. Since we’ve got some new Oxford Products in now I thought I’d correct that by writing up about the Oxford Dakota 1.0 Ladies Motorcycle Jacket! 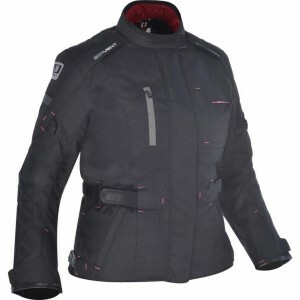 The Oxford Dakota 1.0 Ladies motorcycle Jacket is a fantastic jacket for you lady bikers out there that are looking for a worthy addition to your collection whether you tour, commute or just ride on weekends. It’s a full length jacket with an outer shell made from 500D Polyester that has DOBBY reinforcements for extra toughness. All of the seams are engineered to make the jacket perform as well as it can by using hidden strutcure stitching made from 3-ply Nylon bonded coated threading. There’s also extra layers of material in carefully thought out critical areas and are stitched in using “Bar Tack” stitching for added durability and to bring out the best performance in this jacket. The outside of the jacket also features a ventilation system up just above the collar bone and toward the shoulders. These two air vents can be opened up along with another, larger vent on the back of the jacket to allow air to pass through and keep you cool when your ride out is getting a bit warm. But if warmth is what you want- there is a thermal liner inside that is made of quilted insulation that you can remove or wear the jacket with as you see fit. Speaking of liners- The jacket also has a waterproof lining for keeping dry on rainy trips and works with the Storm Flap System on the front of the jacket where it zips up. It does this with velcro closures and uses overlaying materials to create a sort of rain gutter and make it as difficult as possible for rain to get in from the front opening of the jacket. It also sports several adjusters on the arms, waist, hips, cuffs and collar to both customize the fit and improve performance by reducing wind resistance. And it keeps the fabric from flapping about at higher speeds. The Oxford Dakota 1.0 Ladies Jacket also has your safety in mind by helping you to be seen- the jacket has 360 degrees of reflective panels and transfer designs to make sure that there is something to reflect in every direction and ensure that you’ll be seen in the headlights of other road users at night or in low-light. The jacket has pockets in the elbows, shoulders and a pocket for a back protector- while it doesn’t come with a back protector it does come with the shoulder and elbow armour, both rated to CE Level 1. So if you’d rather put in your our own armour of choice or try our own 5 Piece CE Level 2 Soft Armour, it is easily done. As well as keeping you safe, it also has pockets for keeping your belongings safe! There’s pockets on the front where you would expect to find them on any jacket as well as an internal smart phone pocket that is even touch screen compatible. The Oxford Dakota 1.0 Ladies Jacket also has an 8inch YKK Vislon zipper that is compatible with all Oxford Trousers. So you can connect your jacket to your pants, keep out any unexpected breezes up the back of your jacket and keep your pants from moving down in spite of numerous changes to your riding position. 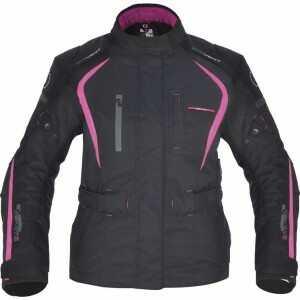 The Dakota Jacket comes in sizes XS all the way through to 3XL and isn’t just available in pink. You can also find it in Baby Blue, Black, Pink, Purple and Flou Yellow. At £84.99 The Oxford Dakota 1.0 Motorcycle Jacket is amazing value for money when you consider all of it’s features and its ability to protect the rider from the elements. Once again, Oxford have thought of everything that a biker could wish for in a jacket and put as much of it as they could into one quality piece of kit. But don’t forget about Ghostbikes.com’s pricematch deal. You could get yourself some money off by having a shop around because if you can find it cheaper somewhere else, we’ll do our best to beat the price. So let us know if you find anything! Thanks for reading all! 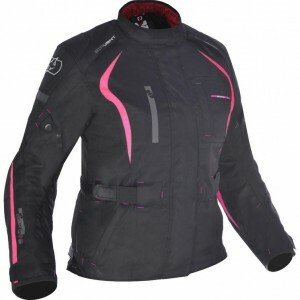 I hope you’ve found this blog installment informative, that the ladies are convinced it’s a fantastic jacket and that the guys are equally convinced it would make a perfect jacket and gift for a lady recipient.